The myth of Napolo has continued to dominate the Malawian society for as long as the nation was born and remains both a subject of literary discussion and sociological interest. From the literary perspective, writers, poets and musicians have written and sung about it—imagining its prowess, callousness and regenerating fertility powers. The Napolo myth has inspired these artists to find a foothold for their literary escapades. But what is Napolo? This is the question both society and geologists answer differently. In literary perspective, however, Napolo’s definition mirrors that of society. Literary critic Nick Chowe writing in Return to African Roots: The use of myth in Chimombo’s and Nazombe’s Epic Poetry says Napolo is the mythical serpent that lives under mountains and is associated with landslides, earthquakes, and floods. He says when the serpent is unhappy, it causes climatic and geological change as what happened between 1945 and 1946 when a cyclone devastated Zomba town and claimed a number of lives. The devastation happened again in 1992 when parts of Mtiya were ravaged by floods [Napolo] from the mountain. Another critic Alfred Msadala contends that Napolo’s feature in Malawian literature is conspicuous as writers, drawing insights from society, have used it more in metaphorical terms than in literal sense. “Poets such as Chimombo, Jack Mapanje and Felix Mnthali have used the Napolo metaphor to enrich their works and disguise meaning, sometimes from the probing eyes of political agents,” he says. The lines depict Napolo as an old serpent that returns to the land to destroy all living things and herald a rebirth. Further in his anthology Napolo and the Python, the epic poem chronicles napolo’s disturbance wrought upon the land with the creation of valleys in its passage from the mountains where it dwells. Chimombo is looking at the literal perspective of the Napolo but at the same time turning it into an allegory of political upheavals created during the one-party state regime, argues Msadala. In these lines Mnthali subtly refers to Dr Hastings Kamuzu Banda whose regime incarcerated him as a ferocious Napolo [serpent] that revels in destroying others, Msadala opines. However, not only writers have drawn inspiration from Napolo to create their works. Musicians too have sung of Napolo. For instance, Paseli Brothers sang Napolo Wachabe following floods in Zomba in 1992. The song literary calls Napolo callous. “Napolo wachabe/Watenga anthu ku Mtiya/Kukataya ku Nyanja/Wachabe…” And in recent years other artists such as Giddes Chalamanda have also sung of Napolo’s destructive nature. Apart from Zomba, Napolo also occurred in Phalombe on March 10 1991 where flood waters from Michesi and Mulanje mountains claimed hundreds of lives, destroyed homes and washed away crops. Coming closer in time this month, the heavy rains two weeks ago has revived the Napolo stories. In Group Village Head (GVH) Mpama in Chiradzulu Fafafa River broke its banks and flooded the western slopes, destroying houses and farms. The locals insist it was Napolo and not floods. Yet, geologically, what happened in Chiradzulu on March 7 is regarded as rock avalanche which is a landslip and massive flooding by saturation of rocks and boulders on the slope of the mountain. But Chancellor College lecturer in Sociology Charles Chilimampunga explains that the people’s beliefs mirror what society has held to be the case for the lack of scientific knowledge on the causes of phenomena. “To many people in the past [and even today] the cause of phenomena like Napolo could not be easily explained due to lack of scientific knowledge. It was believed that when people died, their spirits became active and when people angered the spirits their response was to send Napolo, famine, floods and other calamities. “So generally due to lack of scientific knowledge, the people turned to spirits for explanations,” he says. That is how people view it in Chiradzulu. It is a belief shared by many. To them the word ‘floods’ does not exist in their vocabulary. 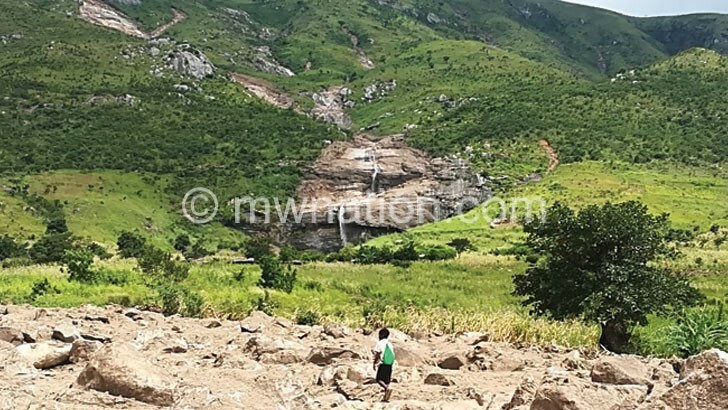 One 55-year-old Robson Kasawala from N’nunkha Village located one-and-half kilometres down the western slopes of Chiradzulu Mountain refutes vehemently that it was floods that ravaged four villages—N’nunkha, Kasambwe, John and Kavina that night. “These were not floods. It was Napolo. After four days of incessant rainfall, Fafafa River got swollen. Eventually, Napolo passed in the river down below, destroying everything it the wake of its passage,” he claims. Just as portrayed in Napolo poetry, Kasawala describes the events of the night as strange and terrific. “The sound bore the fury of the gods. Then around midnight amidst the torrents we heard the sound like that of a speeding train. My house shook to its foundation. My eight children, wife and I held our breaths. And not long our house crumbled,” he says. Yet, others say they heard sounds of flying planes overhead. One such person is village head N’nunkha whose house was smashed by the rolling rocks from the nearby mountain. “I took my seven children out in the rain and told them that achakulu-akulu akudusatu [the ancestors are passing by],” she recalls. A total of 992 households were affected by the wrath of Napolo in Chiradzulu.